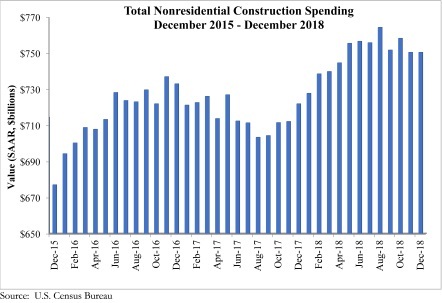 National nonresidential construction spending remained virtually unchanged in December, according to Associated Builders and Contractors’ analysis of U.S. Census Bureau data. Nonresidential spending totaled $750.5 billion on a seasonally adjusted annualized basis in December, up 4 percent year over year. Public sector nonresidential spending declined 0.6 percent for the month, while private sector spending increased 0.4 percent. On a year-over-year basis, public spending is up 4.8 percent while private spending is up 3.4 percent. “History will view 2018 as a solid year for nonresidential construction spending in America,” said ABC Chief Economist Anirban Basu. “While a 4 percent increase may not sound spectacular, this figure must be considered in the context of supply constraints. 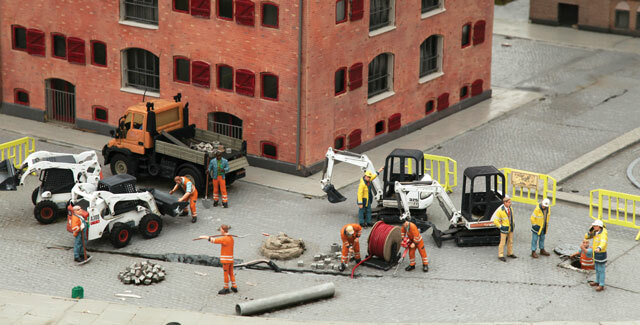 Contractors have continued to suffer through growing shortages of skilled workers. While demand for construction services has been strong, the capacity of the nonresidential construction industry to put more construction in place has been suppressed by a dearth of available carpenters, glaziers, ironworkers, roofers, superintendents, electricians, etc. “It is conceivable that the sharp increase in construction materials prices that characterized the early months of 2018 resulted in the postponement of certain projects,” said Basu. 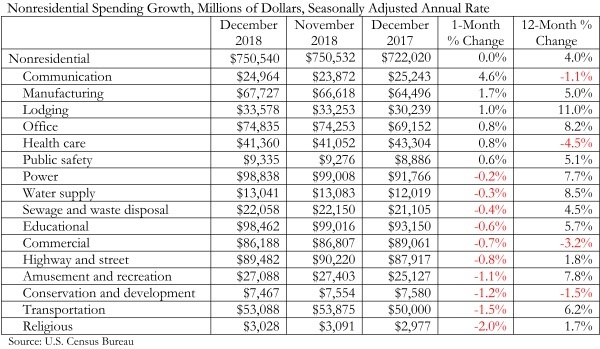 “Nonetheless, both private and public segments experienced growth in construction spending last year, with public spending up nearly 5 percent on a December-over-December basis. Moreover, the pace of growth in construction materials prices moderated sharply during the second half of last year. For more info on ABC, click this link. It’s super clickable. Honest.